A cockfighting rooster is reported to have attacked its owner Singrai Soren and slit his throat with razor blades the chicken had attached to its legs. Villagers in Mohanpur, West Bengal, were warned not to approach what police described as ‘an unknown rooster with black and red feathers’. 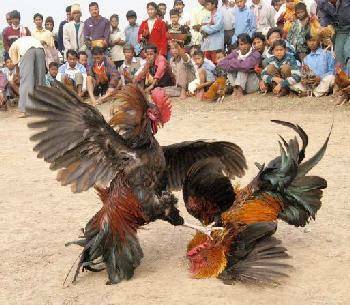 Cockfighting roosters have razor blades attached to their legs before a pair of birds are put in a ring and fire dot fight each other. The razor blades often pave deadly -slashing their opponent. This particular rooster appears to have taken deadly revenge on its trainer for forcing it back into the ring too soon. They are usually given a break of at least an hour before taking on another opponent. More strange ways to die. This is some funny shxt.. lol & good for that fool! He’s the DUMBASS for pushing it back in the ring REPEATLY! I once saw cockfightiing in Bali and am suprised this doesn’t happen more often. Chickens with deadly blades strapped to their legs were running / flying around everywhere.